I'm working on a tote bag to carry various swimwear items to the pool, similar to bags from ThirtyOne. I want the bag to be able to hold itself up & open, but still be able to make it mostly flat for storage. I'm using some outdoor canvas-type fabric. To stiffen it, I'm thinking of using boning in the corners and around the rim. My main concern is that the boning could get creased if the bag is shoved around. Is there a better option for providing this support? Drew is a new contributor to this site. Take care in asking for clarification, commenting, and answering. Check out our Code of Conduct. Boning around the rim is a good idea to make the bag stiff enough to hold itself open, but boning in the corners would make it impossible to fold the bag up for storage. 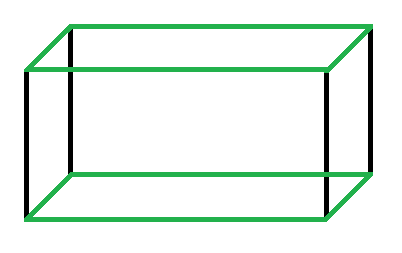 You can add boning only in the green lines. A heavy canvas is strong enough to hold the bag open, especially since the material is doubled in the corner seams. You actually don't need much strength to hold the bag upright because its own weight is negligible. For the boning itself you should use plastic boning. Since the bag is supposed to carry potentially wet items into a potentially wet environment (the pool), you should avoid metal boning because it could rust in time. You need to cut seperate strips of boning for each edge around the rim. After cutting the right length, clip or file the corners of the boning to avoid damage to the fabric. If you think the boning is not strong enough to make the bag as stable as you'd like, simply add another strip of boning to the same edge. Plastic boning sold by the roll is a huge nuisance to make lay flat, be warned. If the boning option doesn't suit you, look in the embroidery section of your favorite craft store for something called "plastic canvas". It is sold in 8x11 inch sheets and it is used like needlepoint canvas for yarn crafts. It is a flat plastic mesh material. It's easy to cut with household scissors. I like to use it in the bottom of tote bags that I make so it will have a flat bottom.. and since it's plastic, I don't have to remove it for washing or worry about it getting wet, unlike cardboard. You might consider using 1.5-2 inch wide strips around the upper edge of your bag (between the outer bag material and the lining to help stiffen the opening. Hope it helps. Drew is a new contributor. Be nice, and check out our Code of Conduct. Not the answer you're looking for? Browse other questions tagged sewing or ask your own question. Can I substitute fusible interfacing for sew-in interfacing? What type of stitch is a perfect fit for elastic materials (as close as possible to Nike's sport gear for running)?